I renewed my interest in hotel architecture and architects after discovering the vital part the Poinsett Hotel played in the reimagining of Greenville, SC. The hotel had survived almost 20 years of neglect; a symbol of what was not working in the core of the downtown district. The reopening of this hotel was key to Greenville’s past, present and future. Across the country there are countless cities in decline that are trying to find a way to reinvent themselves. The historic significance of Main Street USA architecture is playing a part in the rebuilding of these cities. Their are always naysayers who find a problem for every solution that make revitalization difficult. It is hard for the old guard families, who’s history they feel will be forgotten, to find a way to connect to a new vision for the place they call home. In 2016, people are making decisions about where to live based on a sense of place, and the availability of a significant architectural inventory they can afford and give new life. The romance of historic hotels, the part they play in the life of a community, an architect like W.L. Stoddard of New York, who designed the Poinsett, this was a subject I have throughly enjoyed researching and writing for this year’s blog challenge. From A to Z, join me in April to enjoy hotels, inns and spas. Where possible, I have written from personal experience. Saving the Poinsett was key to further growth in Greenville. All of the places I have written about are important to their locations, the citizens and to the guests who pass through their doors. 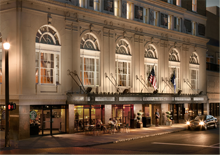 The Francis Marion Hotel – Charleston, SC. Mayflower Hotel – Seattle, WA. The Evanston Orrington Hotel – Evanston, IL. This entry was posted in A to Z Blog Challenge April 2016 and tagged Main Street USA-architecture, Poinsett Hotel-Greenville, SC. WL Stoddard-architect. Bookmark the permalink. Looking forward to your posts. Interesting photographs so far. Hope you will have time to come back in April and join me on this hotel tour. The history of these places fascinates me. Right up your alley. One of the hotels I write about is the Orrington in Evanston, a place that was a part of our growing up. Hope you will have time in April to join me on this hotel tour. LOVED researching and writing about these interesting places. Looking forward to your posts on what will undoubtedly be an interesting tour of hotels grand and not so grand but memorable. I have the clearest picture in my mind of being in France, looking up to a window where the garden club was staying and seeing you and Tucker smiling and waving down at me. This arm chair travel hotel tour does include places I hope everyone will enjoy. Especially you! That’s a great theme1 I’ll be particularly interested in reading about any hotels with stories about hauntings. Oh dear, no hauntings, but inviting you to take the time anyway to join me in April for this hotel tour. Promise you some fun destinations. Selecting a theme that is of interest to this large blogging #Challenge world is difficult. I hope you do have time to join me in April for this hotel tour to special places. Hope you have time in April to join me for some arm chair travel to the hotels I have selected to write about. Many of them because of personal memories. Special places with special stories. What an interesting theme. I’m looking forward to it and lots of pictures I hope. Lots of pictures, a few youtube videos and beautiful destinations. Do join my in April for this hotel tour. History and architecture; two of my favourite subjects. 🙂 Looking forward to your posts! Thanks for visiting The Doglady’s Den earlier. Hope you do have time to take the hotel tour with me in April. Deciding on a theme of interest to new readers is difficult, don’t you agree? I’m pleased the “sound” of history and architecture might cause you to join me. I’ll do my best to check out your posts. History and architecture are favourite subjects. 🙂 I do agree that it’s difficult to pick interesting themes year after year. First time out, I used “Travel & Culture” and it’s hard for me to top that one. That’s a brilliant theme. Did you chose them from all over the world or will you be focused at a certain region? Well, I will find out and I am looking forward to it! Arm chair travel has many advantages if you can’t afford the time or the place. This hotel tour is in the US, southern, with other wonderful destinations like Seattle, even Italy. I hope you will have time in April to join me. Oh fun! Looking forward to your posts! Hi Jean: With many choices, getting this theme right for folks isn’t easy. Delighted you find my hotel tour something of interest. Do come back in April. See you then. That is a cool theme. The most interesting hotel I’ve ever been to was the Grand Hotel on Mackinaw Island. It was huge and fancy. I didn’t write about The Grand, but have always been interested in it. How lucky you are to have been there. Hope you will come back in April and join me for this hotel tour to places you will like. I wonder if I’ve ever visited any of the hotels on your list. I’ll have to check back often to see. Hope you do have time to join me on the hotel tour, busy girl that you are. See you then! What a fun theme – can’t wait to follow your posts. Inviting you to return in April for the hotel tour. Interesting places for sure. Glad you think the theme has an appeal for you. An interesting theme. I love old hotels, and your photos are lovely. Hi Deb: inviting you to come back in April and take the hotel tour. Maybe I have written about one of them you know about. See you then I hope. Cool! Why do I have a feeling I’m going to wish I’d read your post on the hotel in Charleston before we visited last summer? We stayed at a nice hotel downtown but it was nothing worth writing about! Charleston is one of my favorite places. Am of the opinion that just being there, wherever you stay, is special. Hope you have time to take the hotel tour in April. That’s an interesting theme and beautiful pictures! I like that quote at the end. I haven’t stayed in very many fancy hotels, but the few I have been to were excellent! Inviting you to take the time during April and join me on this hotel tour. Interesting stories surround these special places. Hope you have time in April to join me for the hotel tour. I love older homes. I always wonder who lived there, etc. You’ve a great theme. I’ll be visiting. Looking forward to seeing you again in April. Hope you have time to take the hotel tour. Hi Ann: do visit in April for a bit of arm-chair traveling on my hotel tour. We’ll have tea along the way. Hi Stepheny, I’m glad to know I haven’t missed your a-z challenge. Great theme idea. Hope you’re doing well. Think of you so often. I haven’t seen any of your posts-notified by E-mail when you publish. Are you okay? Tried to send you an invitation to resubscribe but WordPress thinks you are already subscribed. Maybe you can try it again from your side. Thanks for checking. I haven’t had time to look at my end. I NEED to get this straightened out because I LOVE your blog. Oooh now that’s a unique theme! When I was in Jonesborough, TN, the historic inn was the center of the town. I found it fascinating. Wish I had written about YOUR Jonesborough Inn. I haven’t had the pleasure. Hopefully, you will have time to return in April and find other hotels I’ve written about of interest. See you then. I hope you will have time in April to come back and visit. The #Challenge is great for making new blogging friends. I love hotels, inns, and bed and breakfasts too and I love a good spa. So I’d be very curious to see what you’d share here in April. I should have consulted with you about what hotels etc. you would recommend. The usual difficult letters remain undone, but otherwise, I’m ready! Do come to see me in April. We’ll have tea along the way. If I remember, at The Washington Duke Inn. I’m excited about all the virtual travel I’ll be doing here. Nice! Thanks for dropping by, and enjoy the Challenge. Delighted you responded positively to the hotel tour theme. I do hope to see you in April. Interesting theme, and I’ll be reading. Where I work in Binghamton, New York, we have some sad, crumbling historic buildings I pass on the way to work every day,. There is a wonderful history behind them. I may focus one of my posts on two of them. If only I could join you to see your historic buildings. PLEASE do write about them. If all else fails in your research, give them a new story, crediting your imagination. In the revitalization of places like Binghamton, the architectural inventory can be an asset. Do join me in April for the hotel tour. At least we can spend time together then. If possible, I would want to hear about “your” buildings. I will look forward to your company for the hotel tour. There will be tea along the way. See you in April. Thanks Jen for the visit. Do take time and come back to visit in April. Lots of interesting places on the tour. See you then! Thanks for stopping by; have you actually visited each of the hotels/spas you will highlight? Awesome theme! Will take notes for future travel experiences. I have visited many of the places I have write about in April. Hope you will have time to join me. I can promise a good tour. If you like hotel and inn, I believe I have great places to visit on this blog tour. Hope to see you then. I hope you will return in April to join me on this hotel and inn tour. Wonderful places to visit. Hotels, inns and spas with photos and youtube videos…interesting and therapeutic. Hi Michelle-hope you will return in April and join me on the tour. I think you will be pleased with the hotels and inns I have selected. See you then. Great idea, Stepheny! I’m hoping to retire to Greenville one day! Greenville is like the poster child for revitalization of downtown historic core areas. On my second blog, mainstreetrockymount.com I have written about this great success story. I recommend the book I mention in my post to gain a new appreciation for all they have managed to accomplish. I had to write about the hotel for the letter P. Do come back in April and join me on the tour. Let’s visit Greenville together. Have loved the research and revisiting memories of hotels and inns in order to write this years theme. I hope you have time to come along on the tour in April. See you then. 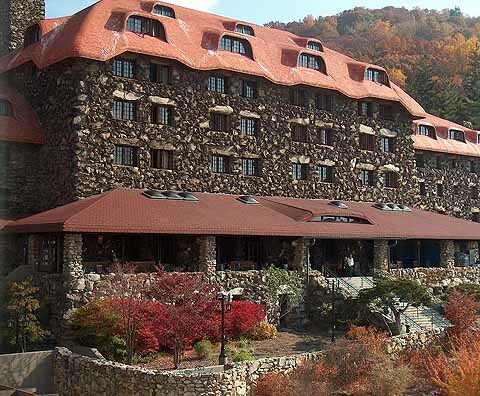 I have a spot for you in the NC Mountains…The 1927 Lake Lure Inn. There are other wonderful places to tempt you. Hope you have time in April to come along with me on the tour. See you then! Fascinating hotels and inn, great locations, the magic of preservation. Hope you can return in April.